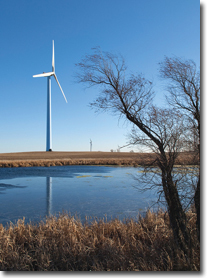 Basin Electric is moving into wind power in a significant way, having completed the $250 million, 120 MW PrairieWinds project in North Dakota-the largest wind farm in the U.S. owned solely by a co-op-and another wind project starting construction later this year in South Dakota. At times, the construction site of the PrairieWinds wind power project in North Dakota looked quite a bit like a Hollywood movie set, with major lighting systems set up to help crews carry out work at night, to meet a very demanding timeline. This $250 million "production" had a very successful outcome, with the 120 MW project coming in on time and on budget. It is the largest wind farm in the U.S. owned solely by a co-op. The construction was carried out by veteran wind power project builders RMT Inc., but this marked the first major wind development for power utility, Basin Electric Power Cooperative. Headquartered in North Dakota, Basin Electric is a regional wholesale electric generation and transmission cooperative serving 135 member systems. These member systems provide power and services to more than 2.8 million consumers in nine states. Those nine states, stretching from the Canadian border to Mexico, are rated as having among the best wind resources in the United States. There will be more wind projects to come for Basin Electric, including a project starting construction this summer in South Dakota. Basin Electric's big move into renewable energy and wind power was spurred suitably-since it is a co-op-by its members. At an annual meeting in 2005, members voted to set a goal of achieving 10 percent of member demand from renewable energy sources. 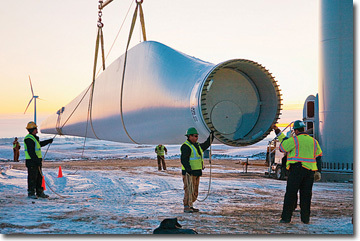 Prior to the PrairieWinds project, the company had been involved with wind power in a limited way, at least directly. 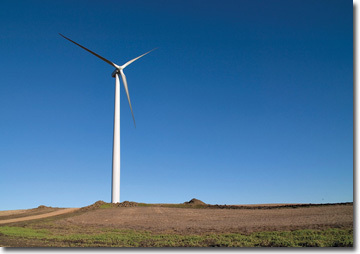 They developed two small projects, each 2.6 MW (two turbines each) in North Dakota and South Dakota in 2002. The following year, Basin Electric negotiated a Power Purchase Agreement (PPA) to purchase 80 MW of wind energy from NextEra Energy wind projects (each with a capacity of 40 MW) located in North Dakota and South Dakota. "PrairieWinds is the largest wind investment Basin Electric has ever done, by far," explains Ron Rebenitsch, Basin Electric's manager of alternative technologies. "We felt that the company could build this project and do it economically and effectively-and it has worked out well." They made the choice to go the "develop and own" route, as an economic substitute for PPAs. "We see wind as a very important resource, and we thought we needed to develop the capability internally to use that resource. "And, importantly, looking longer term, we want to control our own destiny. With owned projects, you don't get to the end of a 15 or 20 year PPA and then be back out in the open market." Basin Electric has a diverse energy portfolio: coal, natural gas, oil, nuclear, and renewable energy. The company operates 3,767 megawatts of wholesale electric generating capacity, 2,827 MW of that being oil and natural gas-generated. Rebenitsch said the co-op has successfully made the transition to develop and operate wind power, building on the skillsets the company's employees have developed in conventional power. Carrying out construction on the PrairieWinds project was RMT Inc. The 80 turbines used on the project were GE's 1.5 MW SLE ESS models. "In terms of construction management, there are a lot of similarities," he says. "We are able to utilize much of the engineering capacity we have in house. We had to develop skills in the siting and analysis of wind and the micro siting of the turbines. That was assisted by the use of wind siting software and limited use of micro-siting consultants to verify our results." Assisting them in this regard were WindPro systems and a comprehensive in-house GIS capability. Due to other workload commitments, Basin Electric also used an outside engineering consultant, Ulteig Engineers, to supplement their engineering department for the collector substation design. "We now have the capability to develop these projects pretty much in-house, with supplemental engineering, as needed, depending on workload. While we have the capability, we have other projects on the go, and we chose to bring in electrical consultants to help design the sub-station and collector system, just as a matter of extending our resources." All wind power development companies generally work closely, and with care, with the landowners where the turbines and wind farms are located. Basin Electric, being a co-op, was in most cases working with landowners who were customers of their member utilities. "The people in the rural areas are literally our owners since they mostly belong to a Basin member co-op that we provide power to. There is a certain trust that is there because we are a co-op, and we were very mindful of that trust," says Rebenitsch. "We had two people working full time, meeting with landowners and coordinating relations with the landowners on what was happening and when." They held public meetings and sent out newsletters to the communities in the area. They worked with about 50 landowners on the PrairieWinds project. "The local population was very receptive to wind projects. There is the revenue from the turbine on your land, taxes paid to the local community, and the jobs that a wind power project brings." Wherever possible and practical, they made adjustments to the plan. "We were able to adjust where some roads went, but we could adjust turbines only slightly because the wind modeling pretty much dictates where the turbines needed to go. This was especially true of the area we were working in with the rolling topography. You need to put the wind turbines on the hilltops, but we adapted roads and cables wherever we reasonably could to accommodate landowner preferences." In terms of infrastructure, there were the typical gravel county roads that traversed the project site, but there was a fair amount of road construction involved, says Rebenitsch. "We upgraded a number of the county roads and built a number of new access roads on a significant part of the project." Some 30 miles of road were built for the project, with additional upgrade work on existing roads. As with many of the states where Basin Electric operates, there is tremendous wind power potential in this part of north central North Dakota, not too far from the Canadian border. The PrairieWinds site itself is on the Missouri Coteau, a ridge of hills that runs along the eastern side of the Missouri River valley in central North Dakota and north-central South Dakota. The site is made up of rolling prairie and croplands. Verendrye Electric Cooperative, had wind data going back a number of years. Through the late-1970s and early 1980s, Verendrye Electric partnered with the U.S. Department of Energy on a wind data collection project. Basin Electric also utilized NREL wind data. "We went through a comprehensive screening process," explains Rebenitsch. "In North Dakota, it's pretty hard to find a bad wind spot, but there are always some sites that are better than others. We were able to zero in on several different sites, and then we had to cross-reference that with the available transmission." The PrairieWinds site pretty much straddles a 115 kV transmission line. The Western Area Power Administration (Western), which oversees a multi-state transmission system in the central and western U.S., built a switchyard for the co-op, and Basin Electric built a collector sub-station next to the switchyard. Environmental considerations were also very important. There were approvals and permitting that involved Western, the Rural Utilities Service, and meeting the requirements of the National Environmental Policy Act. One environmental issue that had to be addressed involved the wind farm site being in the whooping crane migration corridor (a 200 mile-wide corridor between Mexico and Canada). This required substantial work and negotiation on the part of Basin Electric with the U.S. Fish and Wildlife Service, to offset the potential impacts of the PrairieWinds project. Carrying out construction on PrairieWinds was RMT Inc., and the 80 turbines used on the project were GE's 1.5 MW SLE ESS models. "We went through an approved bidders process, and the criteria included that we wanted a contractor with significant experience in the construction of many turbines," explained Rebenitsch. "We also wanted a company with strong engineering capabilities because we delegated a fair amount of the engineering-we provided the initial layouts and RMT developed the detailed design for the roads and the collector system. The engineering work for the foundation design and erection was also delegated to RMT. The total above-ground weight for each turbine is 480,000 pounds, and each turbine foundation required 318 cubic yards of concrete and 2400 feet of rebar. Rebenitsch says that calling the construction schedule tight is "an understatement." "We had an extremely tight timetable," he explains. "Our original construction start date of spring 2009 was delayed due to environmental permitting issues. We were finally able to begin construction on August 18, and we synchronized the last tower 27 hours before the January 1, 2010 deadline." This involved working longer hours, weekend work, working at night (with Hollywood-type lighting), and mobilizing additional heavy equipment for earth work and additional cranes for erection work. The cranes were moved at night, to maximize their availability for erecting turbines during the day. "On Christmas Eve, I was on the phone arranging for snow removal so crews could access the turbines the following morning," says Rebenitsch. Having done that, the site was then shut down by a blizzard on Christmas Day. "We had pretty poor luck with weather." There were also record rainfalls in the middle of the civil work in September and October. November provided some good weather, which helped bring construction back on track. "But we fought the weather most of the time. We had to deal with very cold temperatures in the latter part of December. It dropped to minus 20 degrees, which made it difficult to do the commissioning of the turbines. And we had a lot of heavy, drifting snow." Throughout the project, and with all their contractors and suppliers, the emphasis was on safety, especially avoiding frostbite in the cold weather. There were no OSHA recordable incidents for the whole project. Rebenitsch says their contractor, RMT, had a good set of resources, in terms of equipment and material. "RMT was able to access the resources we needed. They were able to mobilize a lot of equipment to the site to enable them to move quickly. And they knew what they were doing." Basin Electric had a rigid component delivery schedule. The solution? They built a temporary laydown yard for storage. "By building that laydown yard, we could take delivery of the components in bad weather, when the turbine sites were unavailable. We had to double handle a number of the components, and there was a cost to that, but we were able to avoid detention charges, which would have been even more costly." The 10-acre laydown yard was built just off a nearby major highway. They stored turbine and tower components until the weather improved, and they could get them out to the site. "If it's been raining for four days, and the roads are muddy, you can't drag a 280,000 pound load up a hill and around sharp turns. We were watching hourly for any break in the weather. If it was dry on Sunday, we moved material on Sunday. We moved evenings, nights, weekends, and holidays." With the 120 MW PrairieWinds project now complete, and construction starting on a 151 MW wind project in South Dakota this summer, Basin Electric is well on track for exceeding 20 percent of load coming from renewable energy by the end of 2010. "If you look at the timeline, Basin Electric has had a tremendous amount of growth in renewable energy since 2002," noted Rebenitsch. "In the last eight years, we've gone from owning four wind turbines to having hundreds of turbines, our own and with our PPAs. We're about ready for a breather after the South Dakota project-we'll have gone from zero MW to 601 MW in a fairly short period of time, plus another 44 MW of green power from waste heat recovery." The total investment in renewable energy in the wind projects and PPAs is significant: more than $1 billion. They set out to achieve what co-op members wanted in terms of renewable energy, and they have done it ahead of time and on budget. As part of that, says Rebenitsch, Basin Electric has successfully made the transition to being a wind power developer. He had some suggestions for other utilities looking to ramp up their wind power. "Make sure you receive good advice before you get too far into it. It's been a learning experience for us, but I'm proud to say this project came in on time and on budget and that was a major challenge. "Speaking as an engineer, the engineering on a project like this is not the hard part. The hard part is the complexities, uncertainties, and risks involved in the permitting that-like the weather-you have no control over. "Permitting is something that Basin has good experience in. But the permitting of wind projects is new and unique, and we and the regulatory agencies are learning as we go. I'd hope the process becomes more predictable as it evolves."